Related audio: "The Masonic Destruction of Mexico: Bl. José Luis, the Cristero Resistance, & Lessons for Us Today"
First edition translated into Polish. 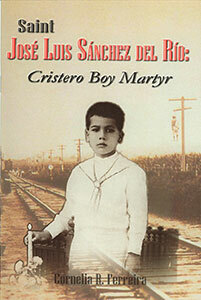 This inspiring book is the second edition of Blessed José Luis Sánchez del Río: Cristero Boy Martyr. It offers a moving portrayal of the virtuous Mexican boy who lived in the early twentieth century, and who was martyred for defending the Faith against a Masonic government intent on eradicating Catholicism from every aspect of Mexican society. The persecution was so violent that Pope Pius XI wrote an encyclical condemning it. The placing of churches under State administration led to the supension by the episcopate of public worship and sacraments. The peasants, forming a militant group called the Cristeros, fought a Crusade known as the Cristiada to rescue the Faith and the land from the Freemasonic forces. Many Cristeros were martyred in public by the government, and their bodies strung up on trees or telegraph poles to intimidate the other Catholics. José Luis grew up in this atmosphere. His was a pious family from a small town, and the young boy was known for his virtuous life, and especially for his great love of the Blessed Eucharist. At the age of fourteen, inspired by the martrydom of a popular Cristero hero, José joined the Cristiada for the greater glory of God. He was taken captive and tortured, but refused to renounce the Faith. The moving description of his last days and holy death will bring tears to your eyes. The Catholic piety that permeates this book, as well as the archival photographs of Cristeros kneeling at clandestine Masses in fields, or lying in rows of martyred bodies, make it highly inspirational for young people and, indeed, for people of all ages. A proven hit with youth groups! A great gift for First Holy Communions, Confirmations and other occasions.